One of the Forms I am working on, I want to hide fields called Holiday 1 Date and Holiday 2 Date based on a drop-down metadata column value selection. Below is the screenshot of the form. Now as you can see from the above code, initially I am hiding both Holiday 1 Date and Holiday 2 Date fields. Then based on value selection in drop-down called 'Number of Holidays Worked' (choice values:0 , 1, 2, Default value is 0 for the drop-down), I want to further hide/show the two date fields. For some reason the code is not functioning properly. Initially its only hiding field: holiday 1 Date and Holiday 2 Date remains visible even though its set to hidden initially. 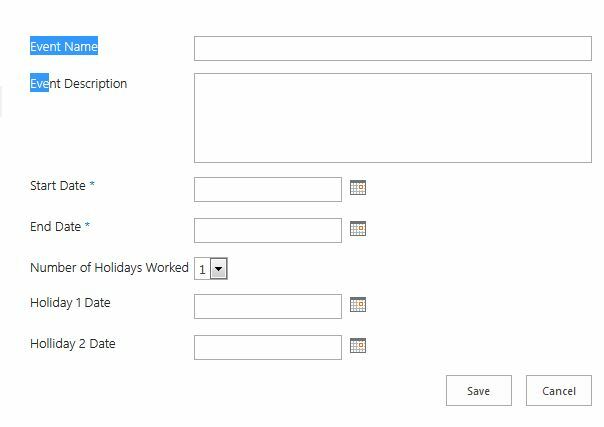 Also once the drop-down value is changed to 1, it makes Holiday 1 date field visible and does not do anything if value is switched to 2 or back to 1. Can someone please help me correct it? Thanks in advance. Your text "Holliday 2" has a typo with a double "l" in the snapshot. Remove the additional "l" and the code should probably work. Not the answer you're looking for? Browse other questions tagged sharepoint-online office-365 jquery jsom or ask your own question.